An unforeseen drama took place within the premises of the Federal High Court in Abuja today, February 9, as the detained leader of the Indigenous People of Biafra (IPOB) Nnamdi Kanu, appeared in court for the continuation of his trial. The mild drama started when Nnamdi Kanu refused to get down from the prison van in which he was conveyed in for his trial. It however took the intervention of his ‎lead counsel, Chief Chuks Muoma, SAN, to persuade Kanu to step-down from the prison van that brought him to court for trial. Although he (Kanu) eventually succumbed to persuasion by his lawyer to alight from the prison van. However, Kanu, swore that he would not allow anybody to remove the handcuffs which he wore into the courtroom but again Chief Chuks Muoma, SAN persuaded him to allow the security officials to take the handcuffs off which he eventually did. 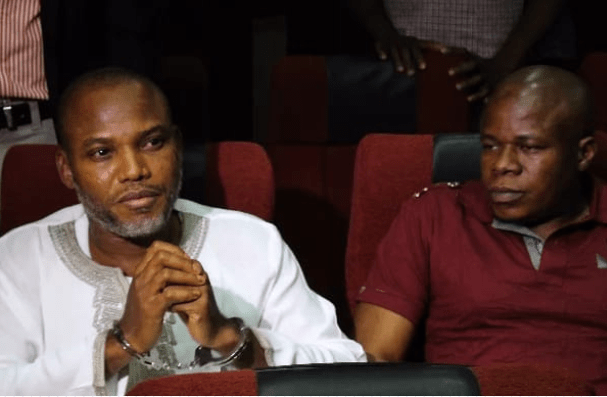 It will be recalled that ‎Justice Tsoho had on January 29, denied bail to Kanu and two other pro-Biafra agitators, Benjamin Madubugwu and David Nwawuisi, who are facing trial with him. The defendants were in the charge that was signed by the Director of Public Prosecution, DPP, Mr. Mohammed Diri, alleged to have committed treasonable felony, an offence punishable under Section 41(C) of the Criminal Code Act, CAP C38 Laws of the Federation of Nigeria. ‎FG alleged that they were the ones managing the affairs of the IPOB which it described as “an unlawful society”. Specifically, Kanu, was alleged to have illegally smuggled radio transmitters into Nigeria, which he used to disseminate “hate broadcasts”, encouraging the “secession of the Republic of Biafra”, from Nigeria. However, the accused persons, pleaded not guilty to the charge on January 20, even as the court ordered their remand at Kuje prison ‎in Abuja.